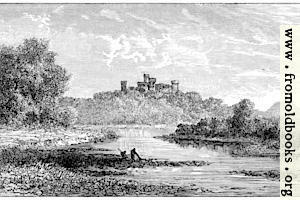 Le Chateau de la Grangefort-sir-Allier. Vue Generale. The castle shown in the distance here dates back in part to the 16th century and in part to the 19th, when it was rebuilt. The picture, engraved by Jules-Jacques Puyplat I think (the book just says Puyplat but the signature looks like it has a J at the start); the original artist is not credited.